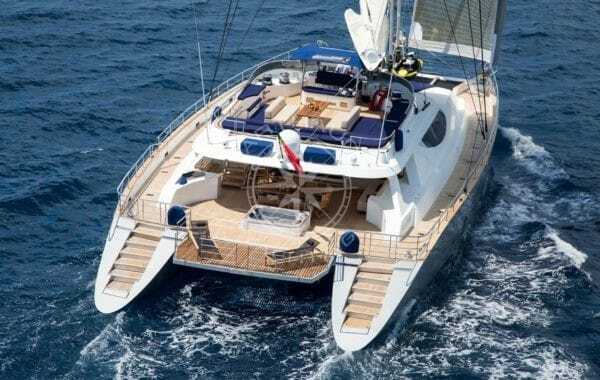 The S/Y Hutiane catamaran is a rare jewel in the yacht industry. 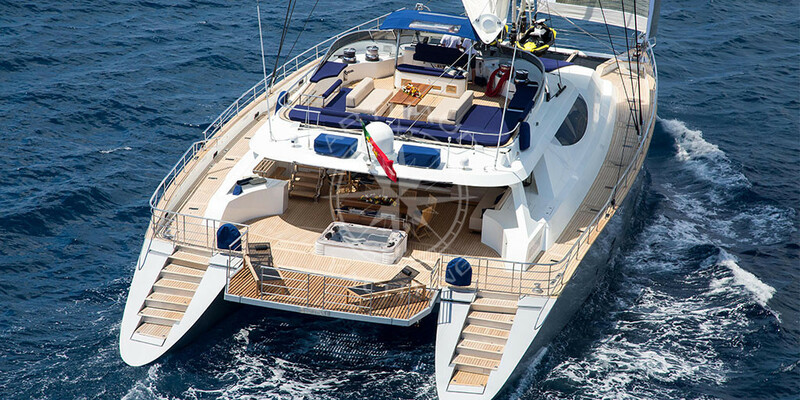 High-end catamaran Hutiane, is a rare jewel of the maxi catamaran industry. This luxurious 31m sailing yacht was built in 2011 by Cuneo Marine and has since benefitted from a full refit in 2015 which has considerably moved this vessel up into the luxury catamaran industry and appointed her as one of the most luxurious catamarans in the French Riviera. With a new refit planned this winter, and complete change of the main sail and code 0, catamaran Hutiane will start her next season in full condition to match the standards of the ever-growing industry. 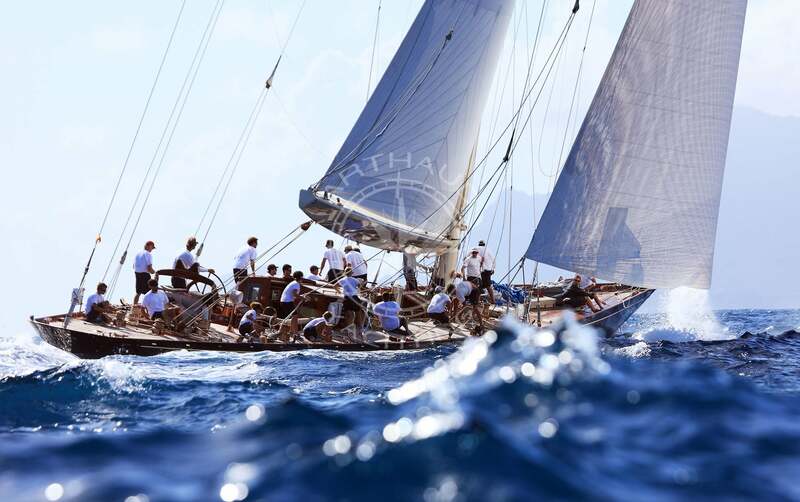 If you are looking to divert from the motor yacht trend but wish to organize your vacation or corporate event on an equally luxurious product, sailing yacht Hutiane is the perfect match. This floating palace will seduce you as much with its elegant décor as with the quality of its proposed services. 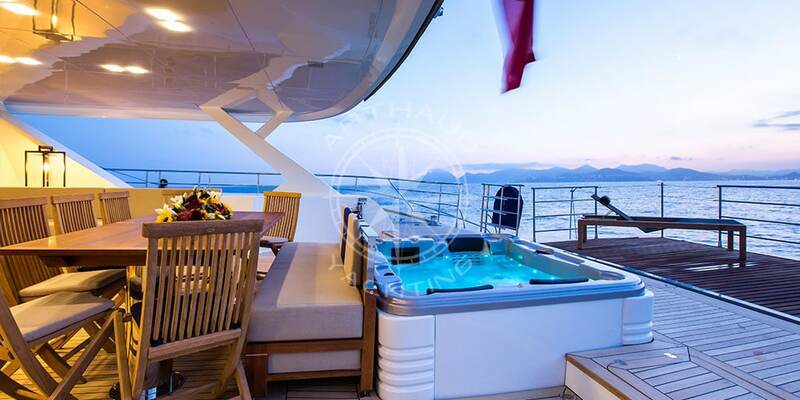 Insanely wide, with her 12.27m beam, she puts 350m² of upscale amenities and thoughtful design at your disposal. Impressive at quayside and majestic at sea, Hutiane has not failed to seduce both particulars and professionals this season. 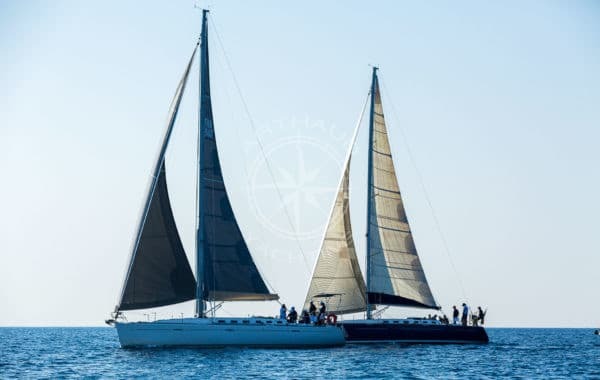 Opt for the best of both worlds, sailing yacht Hutiane is available for charter as a sailing catamaran for those looking for a traditional and authentic experience, yet she is also capable of navigating at a cruising speed of 9 knots and maximum speed of 13 knots powered by two Iveco Diesel engines with 440 HP. 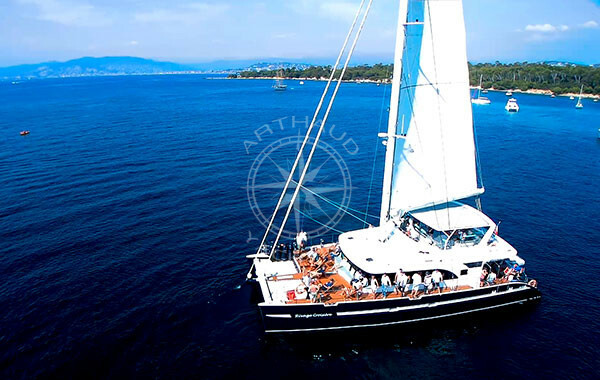 What is even better, and undeniably one of her biggest advantages, sailing yacht Hutiane has a maximum capacity at cruising of 30 guests. Ideal for your day charters with family and friends, or for your corporate incentive cruise, you will no longer need to cross out names from your list! Qualified crew at your service on the catamaran S/Y Hutiane for hire. Capacity for 30 guests on a cruise. 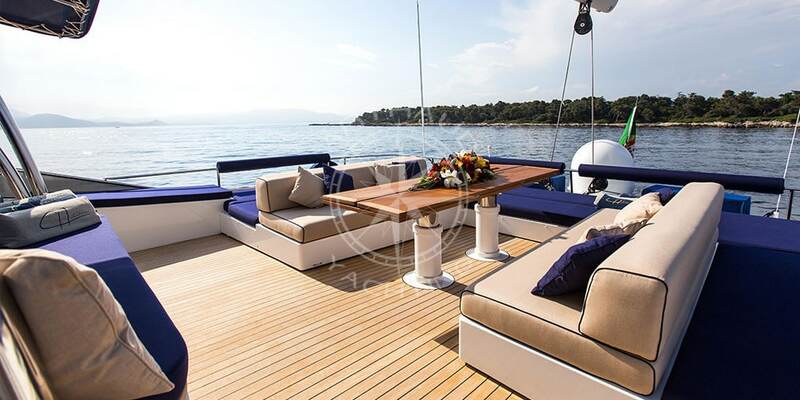 A cruise experience on-board this prestigious yacht is accessible to all and will allow you to discover the most beautiful areas of the French Riviera, Corsica, Sardinia and the Amalfi coast. 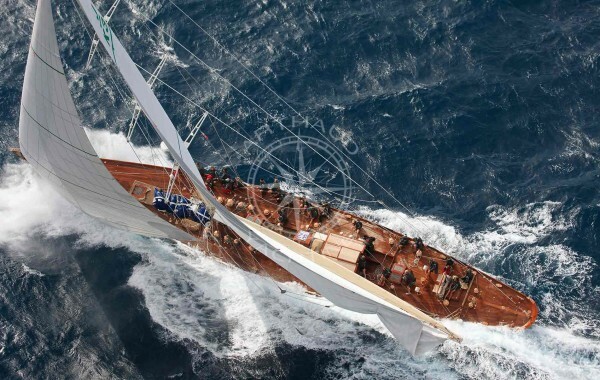 Despite her generous characteristics, sailing yacht Hutiane presents a low draft which will not impact on your desire to approach the coast for a better view. 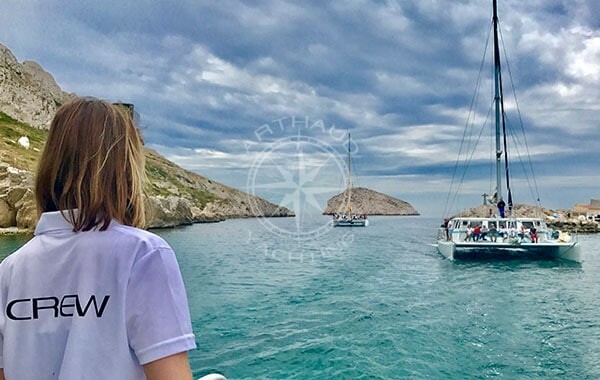 Furthermore, her friendly, dynamic and professional crew are keen to charter at night, a considerable advantage which will enable you to see everything on your itinerary. Indulge in a perfect vacation and take full advantage of all her on-board services and water toys; two jet skis, kayaks, paddle boards, an inflatable trampoline, towable toys, snorkeling equipment, fishing gears – the list is long! 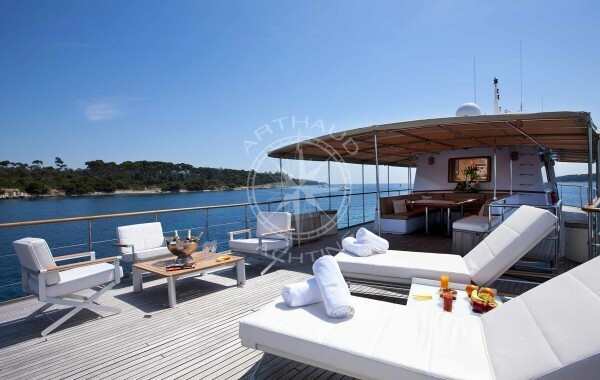 Just as sumptuous at quayside, this luxury catamaran is a head turner when docked in the port. 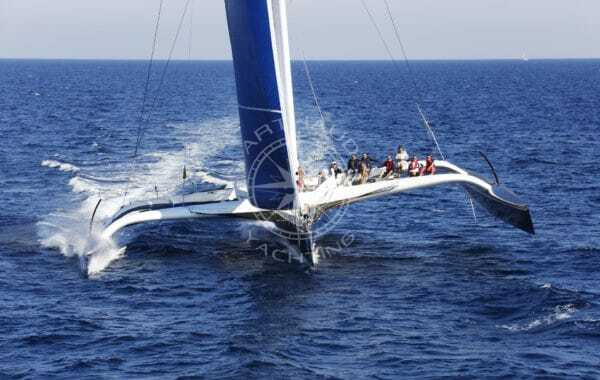 Impress your clients and collaborators and taunt your competitors with this imposing vessel for your corporate event. 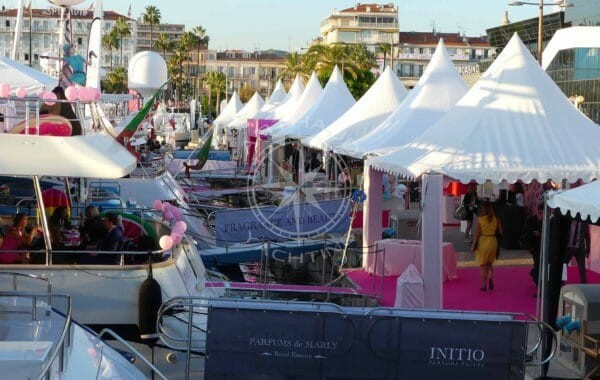 Available for all events: MIPIM, Film Festival, Monaco Grand Prix, Cannes Lions, TFWA, MAPIC charter sailing yacht Hutiane and opt for a jaw-dropping effect! 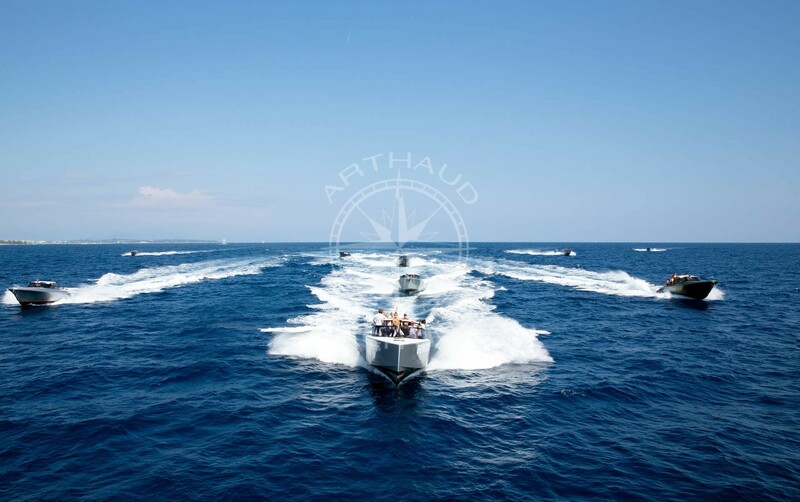 Generous layout, spacious decks and an overall pristine condition is what makes catamaran Hutiane an impressive choice for your corporate seminars. Completely customizable, turn this superb vessel into your very own vitrine to match your company colors and invite up to seventy guests for an unforgettable cocktail event in a luxurious, atypical and comfortable venue. 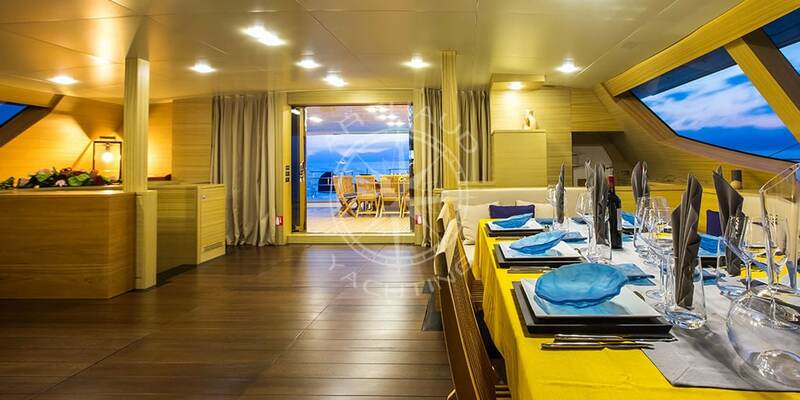 Her interior layout features a generous, roomy living area with a beautiful lounge and dining area completed with four fully appointed and well-equipped cabins with private bathrooms. All situated on the lower deck, her cabin layout sleeps up to eleven guests in a master suite with a grand king size bed and one single bed, a VIP stateroom with a queen size bed, a twin cabin with two single beds and practical pullman, and a triple cabin with three single beds. With timeless styling, beautiful furnishings and sumptuous décor, sailing yacht Hutiane is ideal for both private and corporate charters in the Mediterranean. 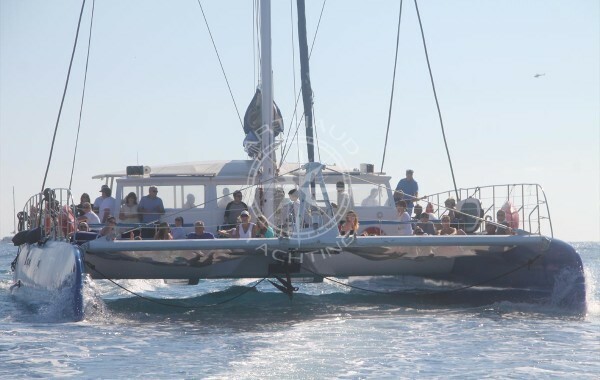 This dreamy catamaran offers prestigious services in an elegant and comfortable environment with a professional crew trained to the highest quality standards whom will be sure to make your overall experience that much more special. 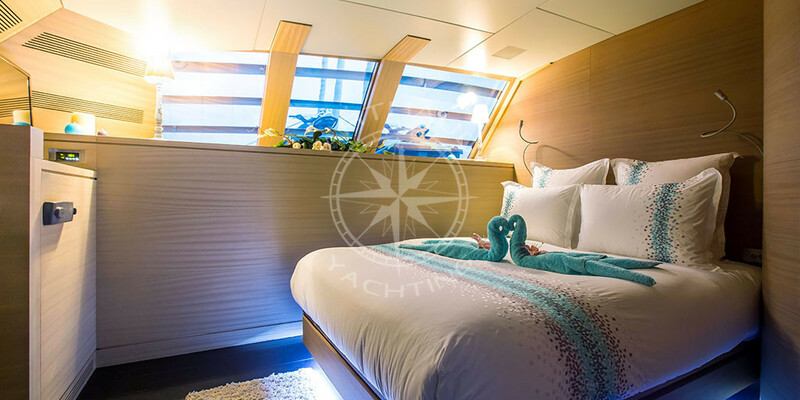 Luxurious catamaran Hutiane: sail or cruise – you’d be crazy to refuse!